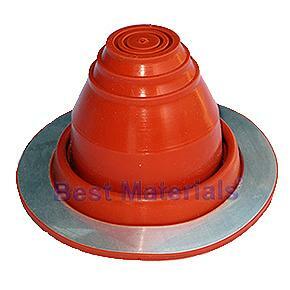 High Quality and Reliability Red Silicone Roof Penetration Flashing. 20 year Manufactuers Warranty. Flexible Base Design adapts to most roof angles. Seals tightly to roof with silicone sealant and almost any type of fastener. The flexible base is compatible with any roofing material -- metal, plastic, asphalt, tile, rubber membrane, and more. Corrosion-Resistant Base -- Made of heavy-duty aluminum alloy for flexibility and corrosion resistance.